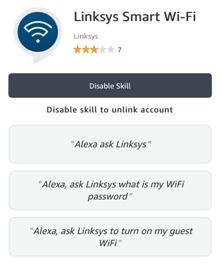 The Linksys Skill for Alexa lets you ask for Wi-Fi information from any Linksys Smart Wi-Fi Router or Velop system and also control the Guest network. 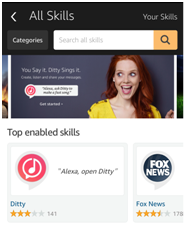 This article will help you learn the Skills and commands for Alexa. ​An active Linksys cloud account. To set up an account, you may click here. 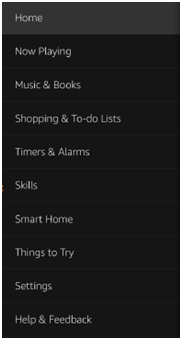 Alexa app installed in your mobile device and working with your Amazon Echo™, Amazon Tap or Amazon Echo Dot. Linksys Skill has been enabled. To know how, click here. Tap on the Home menu. Tap on Your Skills at the top-right corner of the screen. QUICKTIP: If you are having any issues or the commands are not working, you can try to Disable Skill and re-enable it again. You can ask Alexa for the following information of your Linksys Smart Wi-Fi Router or Velop system. NOTE: Whenever you ask Alexa a question, you must use the triggering words “Alexa, ask Linksys…”. An example is, “Alexa, ask Linksys what is my Wi-Fi password?”.